TONEX as a leader in teaching industry for more than 15 years with a variety of clients from government and private sector industries is now announcing the Energy Storage Applications for Non-Engineers training which helps you to recognize basics of energy storage, different types of energy storage system, operation principle, ... See More challenges and application of energy storage in different industries. 1.All professionals in the area of energy storage systems. 2.Non-engineers looking to understand new approaches of storing energy. 3.Individuals who are looking for technical training of energy storage systems. 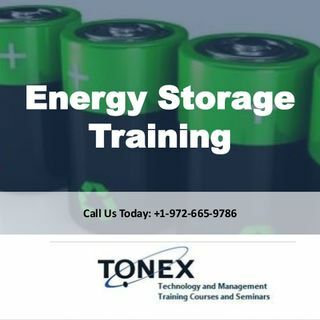 4.Project managers, quality managers, business managers and directors looking for a comprehensive training in energy storage application and operation. 5.Energy storage producers who look for alternatives to improve their energy storage design and efficiency. 6.Executives and managers who are looking to invest in energy storage area. 7.Investors and contractors who plan to make investments in energy storage industry. 8.Technicians, operators, and maintenance personnel who are or will be working on energy storage projects. 1.Understand Fundamentals of batteries and concept of storing energy. 2.Understand the materials used in different types of energy storage and to recognize the operation. 3.Recognize the parameters that control energy storage performance. 4.Describe different application of energy storage in electrical engineering. 5.Explain different application of energy storage in ground, air, or marine transportation systems. 7.Troubleshoot challenges related to energy storage systems. 8.Describe super capacitors, and their applications in the system. 10.Understand the fuel cells and different applications and types of fuel cells in the system.